Don't worry about the long list of ingredients, this is actually an incredibly simple recipe. 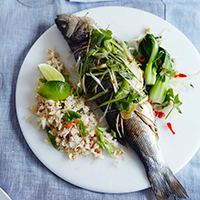 Oven-steaming the fish makes it beautifully light and delicate, and the sweetness of the crab in the rice complements it perfectly. 1. Preheat the oven to 180°C, gas mark 4. Make 3 slashes on each side of the fish. Mix together the lime zest, coriander stalks, garlic, shallots and half the ginger, then stuff inside the cavity of the fish. Tie each fish with kitchen strin to seal the filling inside. 2. Pour 400ml water, 3 tbsp dark soy sauce, the mirin and the lime juice into a large roasting tin. Sit the fish on a wire rack on top. Pour the remaining soy sauce over the fish and sprinkle over the remaining ginger. Cover the tin tightly with foil, leaving space above the fish for the air to circulate. Bake for 20 minutes, by which point the flesh should be white through to the bone (which is exposed by the cuts). If the flesh is still translucent, replace the foil and steam for a few minutes more. 3. Meanwhile, make the rice. Heat the oil in a large frying pan or wok; add the garlic and a pinch of salt and fry intil aromatic. Add the eggs; allow them to set slightly before scrambling. 4. While the eggs are soft, add the rice and turn the heat down. Toss until all the grains are well coated. If it appears too dry, add a little extra oil. Season with the soy sauce and a pinch of sugar and white pepper. Continue to fry until well combined. Stir in the crab and salad onions; set aside until ready to serve. 5. Make the beansprout salad just before serving. Heat the oil in a hot pan, then add the garlic, beansprouts and pak choi. Sauté quickly for 2 minutes, then remove from the heat and add the fish sauce and chilli; finish with the lime juice. 6. Serve the fish sprinkled with the salad onions and coriander leaves, and with the lime wedges, rice and salad on the side.